Dishonored 2 was a long time coming. As far as sequels go it plays things pretty safe, presenting the same cool steampunk world and satisfying magical-stealth gameplay. Where Dishonored 2 succeeds is in its incredible level design and far more engaging story. 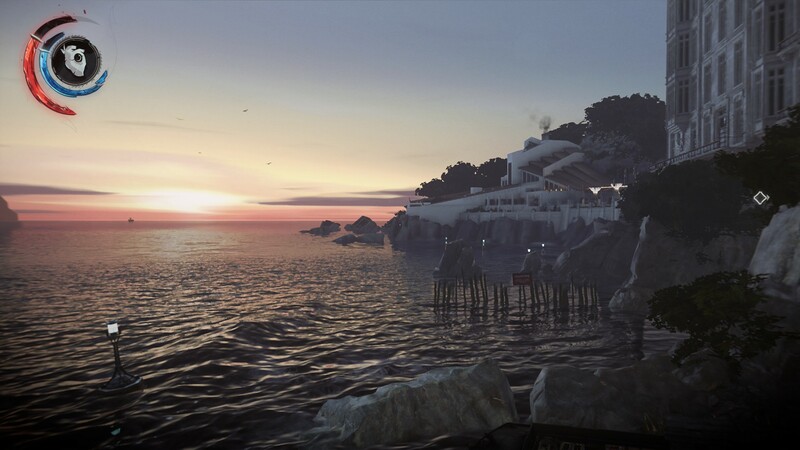 Dishonored 2 takes place several years after the first game. 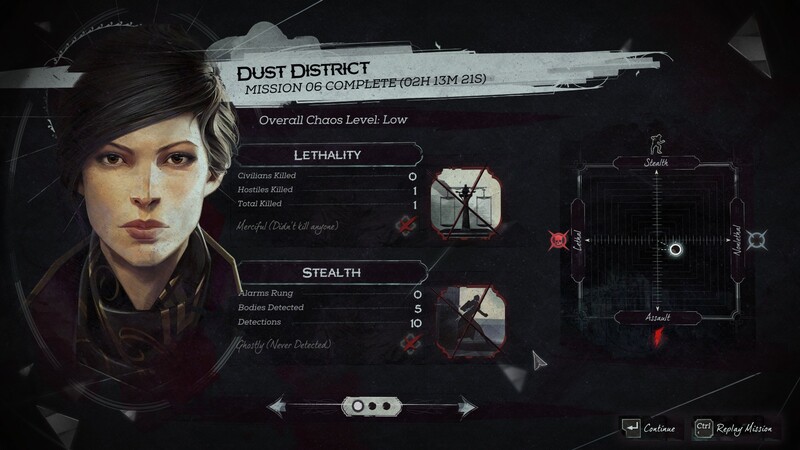 Protagonist Corvo Attano had successfully rescued the daughter of the slain Empress and fought back against the new regime. 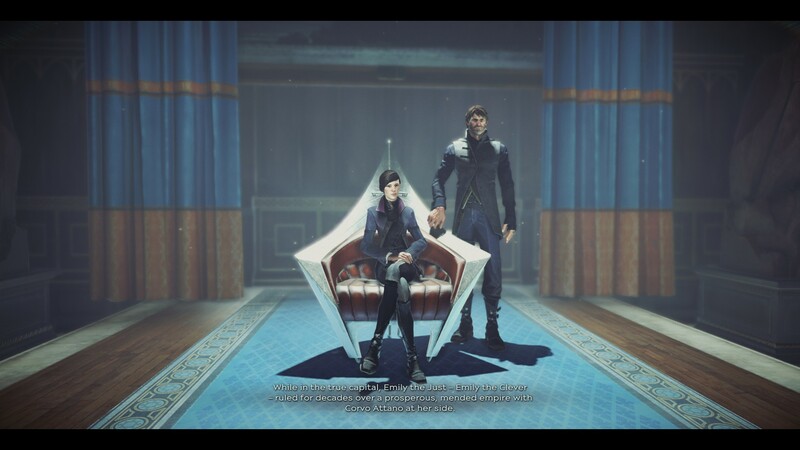 Emily Kaldwin now sits on the throne, though it’s not exactly a time of peace and prosperity. The opening introduces the delicious Evil Queen-like villain Delilah Copperspoon (I adore this series’ character names). She leads a coven of witches who wield the same void powers that Corvo used in the first game, and she appears to be startlingly immortal. You’re given the choice between playing Emily or Corvo in the sequel. Each character has slightly different void powers to aid them in their skulking and assassinating. I played as Emily of course. 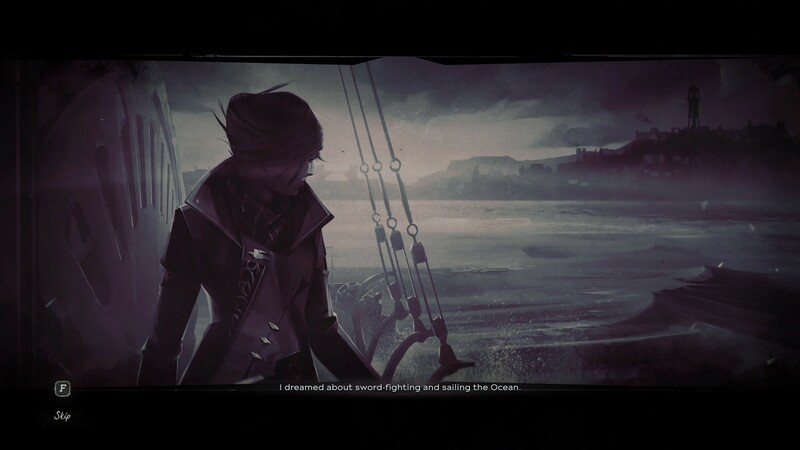 While it’s nice to see Corvo actually voiced (he was a silent protagonist in the first game) I definitely wanted to see how Emily developed as a character, and the displaced, reluctant young Empress seemed far more compelling. From there your character flees Dunwall with the help of Megan Foster aboard her boat the Dreadful Wale, which becomes your base of operation throughout the story. It’s a much smaller, simpler base than the first game with not much to do but talk to one or two people and move on to the next mission. The overarching story becomes a sequence of hunting specific targets as you dismantle Delilah’s power structure and discover the truth behind her powers. It’s a bit too simple and structured, but the individual storytelling within each mission is fantastic. In one of the later missions you have to choose between one of two terrible factions to help in order to access an area – or do a bit of extra investigation and help neither. There’s a lot of fun little scenes and NPC dialogue scattered around the world, making it very rewarding to leap around rooftops and spy on unsuspecting guards and citizens. The level designs are exceptional. 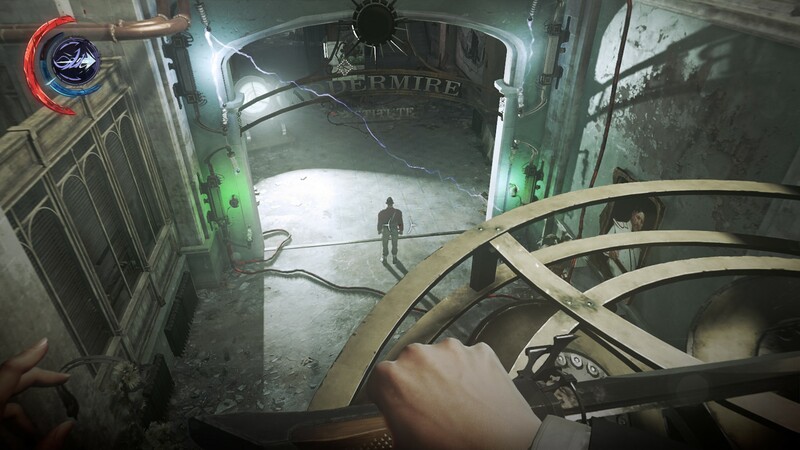 The Greek Island-like steampunk-whaling world of Dishonored is already amazingly cool, with evil witches, clockwork soldiers, electro-gates, and pistol-wielding guards. But the sequel introduces some fantastic new levels and toys, including a clockwork mansion that moves and shifts around you, allowing you to sneak in the in-between spaces. The most astonishing level takes place during two different time periods. You’re given a device that lets you see into the past or present (whichever you aren’t in currently) super-imposed onto your current view, and it’s absolutely magical. The entire level becomes a puzzle you have to navigate, using your ability to time-shift. At your disposal you have a host of special void powers that are so useful they make the game almost too easy – and I played on Hard. Emily’s powers include teleporting to far places, as well as grabbing people, easily separating foes from each other. If there’s too many simply use Domino to link them together and let fly a single sleep dart. If you’re really in trouble, use Mesmerize to stun a whole group as you teleport away. The void powers are nicely empowering, and let you explore every hidden path on your way to collecting more runes and bonecharms. Runes are used to purchase powers and upgrades, and bonecharms are used to passively buff your stats or offer perks – like mana regeneration under water or longer Shadow Walk duration. You can purchase a power to let you craft bonecharms and stack the bonuses into becoming crazy overpowered. The powers are a lot of fun but by the end of the game I was cruising through every encounter with ease. Granted I was taking my time and grabbing every rune and charm and was enormously powerful, but the game just couldn’t seem to deal with its own powers it gave me. There is an option to refuse the void powers and go at it with grenades, mines, and crossbow alone, which feels like a suitable answer to those wanting a far more challenging experience. Alas, I barely have time to play games once, let alone replay with more challenge. Early on you’re given a device that automatically tracks every rune and bonecharm in each level, which pretty much forced me to find and collect every one of them. Each level, from outdoor city scapes to giant buildings is fun to explore and offers a variety of challenges, including blood-fly nests, walls of light, wolfhounds, and patrolling guards. The final DLC for Dishonored, The Brigmore Witches, is hugely important to the story of Dishonored 2. That DLC introduced what becomes the main adversaries for the sequel, which unfortunately took the wow factor out of seeing the witch enemies in Dishonored 2. Not to mention the aforementioned sliding difficulty at the end that made them more of a minor nuisance than a real threat. I was able to complete Dishonored 2 with Low Chaos. The concept of Low/High Chaos returns from the first game, and again represents how many people you killed in your adventure. Like the first game, killing people gives you the High Chaos ending = which is evil and bad. This time there’s no rat plague to make the body count a bad thing – you’re just not supposed to kill too many people. Want the good ending? You’ll need to be more Batman, less assassin. I’m fine with a more nonlethal approach but it feels like a weird conceit, especially since some foes, like the witches, are super evil. The game also goes out of its way to let you take out each and every boss nonlethally. Each one requires you to do an extra side task that usually comes down to some easy busywork, like mixing a potion. You could complete the game without killing a single soul, which is impressive. As a fan of the first game, Dishonored 2 gave me everything I wanted in a sequel and more. The story is far more interesting with a voiced protagonist and fun cadre of villains. The mission structure is still linear but individual levels take full advantage of offering unique gameplay experiences and story moments. And the Chaos levels, void powers, and choice of hero offers a lot of replay value. At this point I would be fully on board with a third game that lets me further explore this fascinating world. 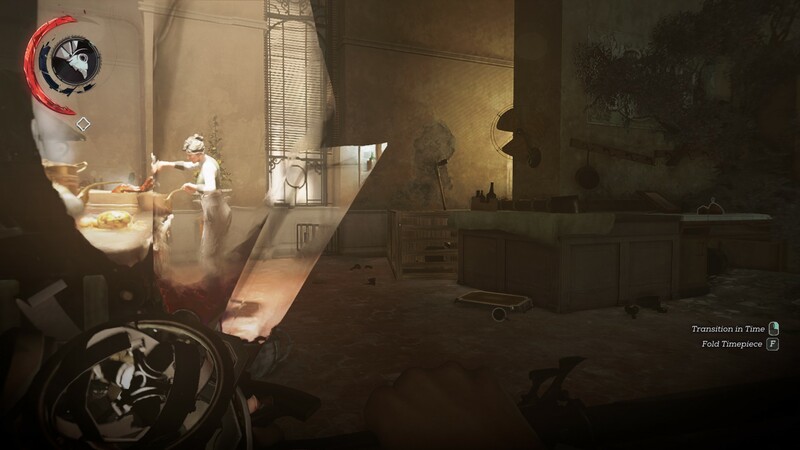 Final Say: A satisfying sequel that fixes many of the issues of the first game to become a memorable stealth adventure. I really did enjoy Dishonored. I wish I had more video gaming time, but I’m sure this will be bought by me at some point. After I get through Assassin’s Creed: Syndicate, Xcom 2, Fallout 4….damn, I guess it will be a while. Yep, I bought it on sale. I find that relatively shorter games are much more appealing to me these days. I get more excited about a 20 hour Dishonored than a 50+ Fallout. Tho I did spend over 50 hours with XCOM 2.